On Saturday 13th September, electric racing came of age. As the streets of Beijing echoed with whining engines, squealing tyres, and roaring fans, Renault driver Nicolas Prost dominated until the final lap… when a shock collision made it almost anybody’s race. Lucas di Grassi of Audi Sport ABT scooped winning place in this first ever FIA Formula E championship race. The excitement was, appropriately, electric. It was the weekend when many a childhood Scalextric dream suddenly grew up. 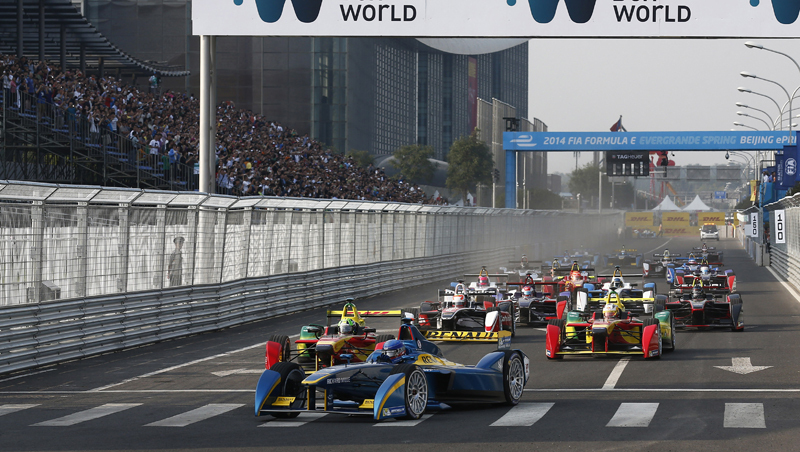 For spectators, Formula E proved a thrilling new entrant to the racing world alongside its fossil fuel counterparts. Saturday’s event launches a ten-race championship that will culminate in the streets of London in June 2015. For the inaugural season, the entire field is competing in Spark-Renault STR01E single seaters. Renault Sport has been part of the project since it was little more than a bold idea in 2012. Indeed Renault played a central role as architect of the electric powertrain and ensuring safety of these impressive racing machines. Our technical knowhow made sure every one of the 40 vehicles competing was quick, reliable and safe from the word go. And for all of us hooked on action, there was no shortage of heart-stopping thrills. Even the closeness of safety barriers wasn’t a problem, as the Spark-Renault STR01E’s unique characteristics let drivers outbrake each other on corners. Formula E is an exciting new challenge set by the FIA (Fédération Internationale de l’Automobile), the governing body for world motor sport. It is intended to serve as a live framework for research as well as drive wide interest in electric cars and promote sustainability.